I know this isn’t a heavily used subsection of the forum, but while I was away for a bit from being active here I did manage to complete all the trophies/achievements for the game. This was my first ever platinum trophy on the PlayStation and actually was one I had joked before that if I ever got a platinum/100% on a game, there’s no way I’d be good enough to do it on this game! Learning outside of the game and then using the game to come back to for fun and additional learning worked great. I think it’s a great supplemental tool and was super excited I managed to complete all the trophies! 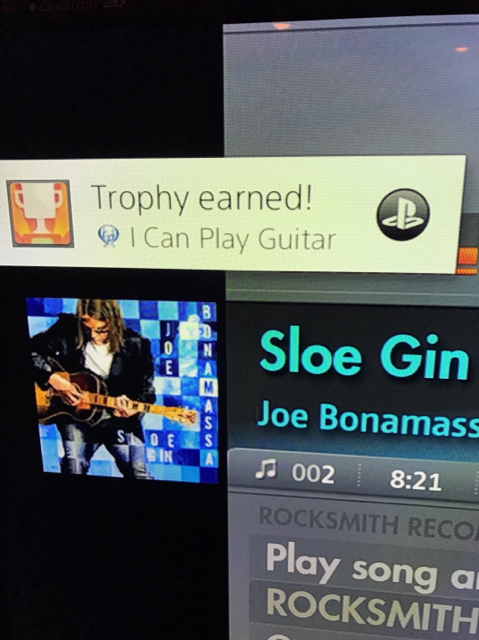 Rocksmith 2014 is partly what got me into learning to play guitar. I've only been at it a few month but am no where near as good as you at this game. Most of my songs are around the 30-40% mark. After I've done Justin's training for a while though I'll play the game some more and see if theres much improvement. Not to say that the game is necessarily the best way to gauge progress, but I would expect some improvement even if its just from being faster. This has reminded me I have this game. Might give it another go!